After taking the dogs out for a short hike down a little mountain trail through the Aspens, I came back and sat down to sip on some coffee. I found myself staring out at this little spot of flowers to a evergreen there in my "backyard". It was just so intimate and poetic. I had the most wonderful camp site up there in the mountains. 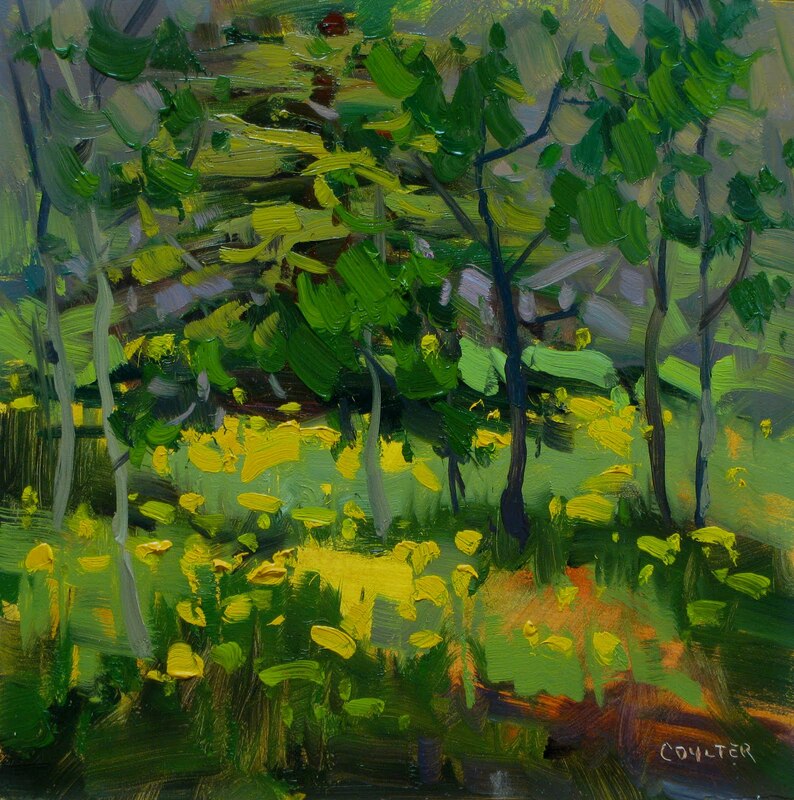 It was shaded on both sides by small aspens and the meadow in front was covered with these cheerful yellow Dandelions. There were mountains in the distance. 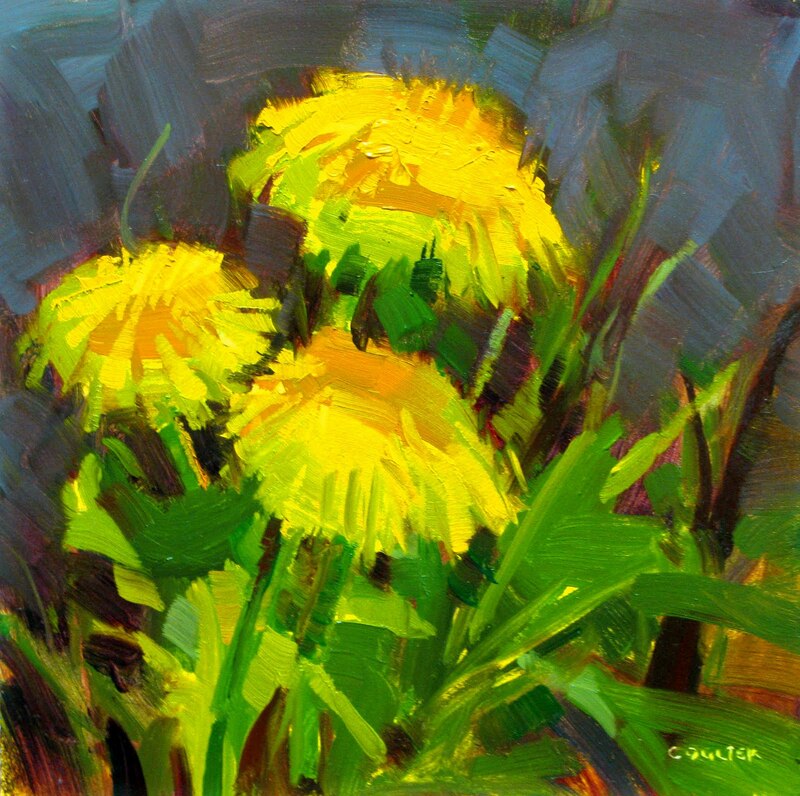 I couldn't call myself a "Flower Painter", but I ended up doing a few of these because they just seemed so happy. I found out that they all close up at night and then open back up in the morning when I was having my coffee, to welcome me into a new day. ﻿﻿ I'm back from my painting trip. This is a view from my camp site where I spent most of the week because of altitude sickness. I went from 2,000 feet to 10,000 and although it had never effected me before...maybe age? Anyway I still had a great time. 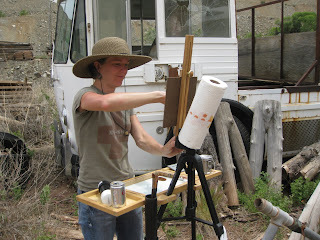 Plein Air painting has given me so much joy in my life for so many years. The process of jumping in my truck with the dogs and traveling across the country following my inspiration only. Throwing on my back pack full of my painting equipment and hiking to the perfect spot somewhere in the mountains, on the coast, by a river, under a tree, or even on a main street of a big city. Where ever it is, I am there at that moment interacting with the environment, the lighting, the weather , the sounds. I see colors out there that I have never seen in a photo, period. It takes far more time and effort, but to me it is so well worth it. That feeling of intimacy with nature is something very, very special. 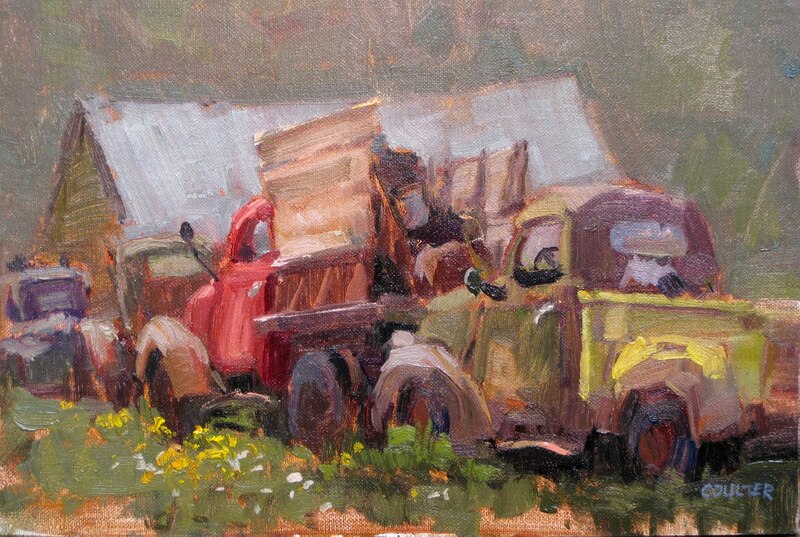 This was a field study I did on my trip last year with my good friends Carol and Penny. 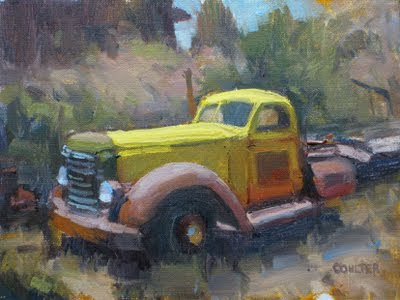 I'm gone on another paining trip to Colorado until June 27th. I like to get away from AZ as much as possible in the summer. 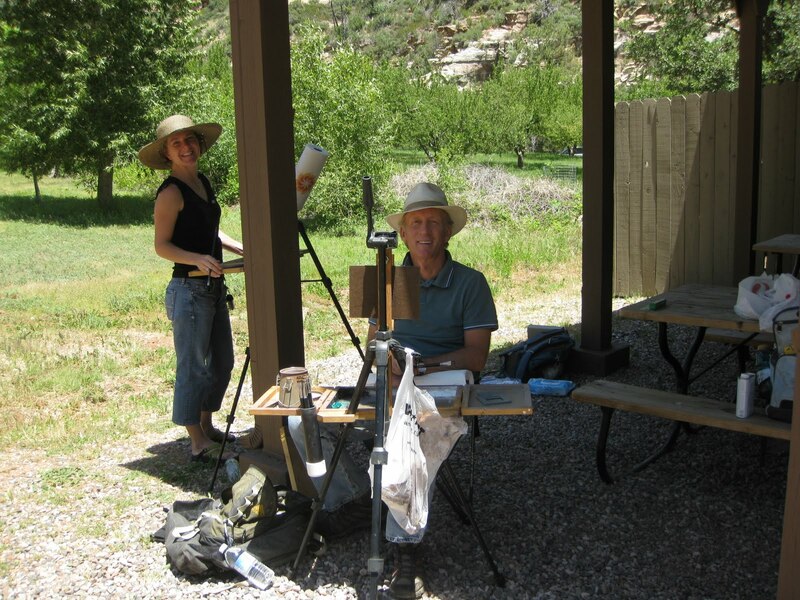 It gets a little warm for plein air painting. ﻿ This truck made a stricking first impression on me when I came across it. I seemed to be saying I'm "ready for anything", bring it on! 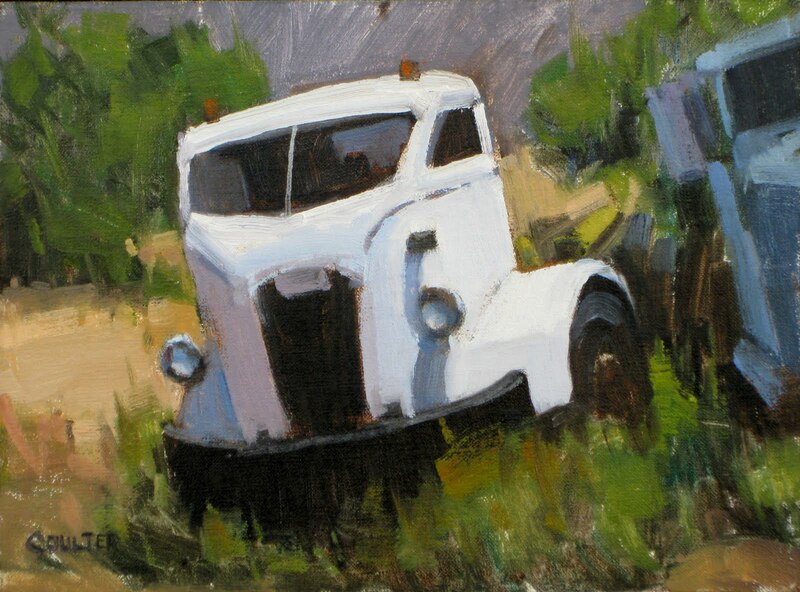 I painted this truck twice, this is the 6x8 version done a little looser than the 6x6 done later. This is when trucks had a whole bunch of character. They weren't muscle, or sleek, or fast, but they got the job done and you could fix them with a pair of pliers and some bailing wire. What can I say? 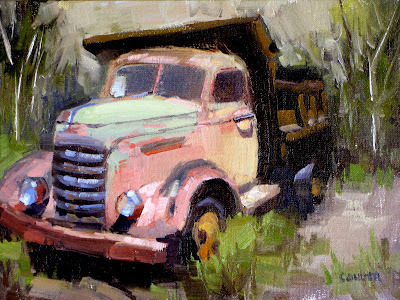 It's a Pick Dump Truck. When Carol and I was walking into the Gold King Mine, one of the guys who works there told us that they had a couple new trucks on the lot. 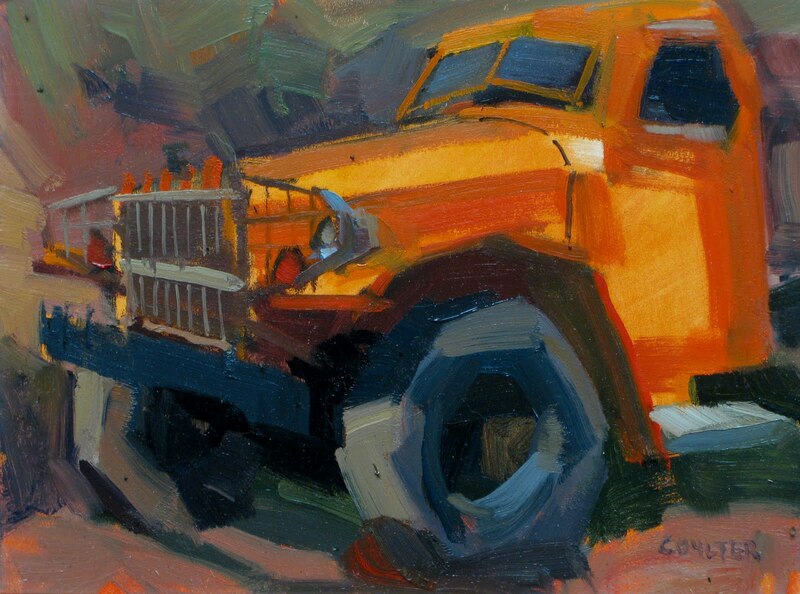 This Orange 4x4 tow truck was one of them. I couldn't resist the design elements of the front grill, the huge tires, and of course the color. This is Carol setting up to paint the yellow bed dump truck. I have been very busy with my "Coulter Plein Air System" business this past month. 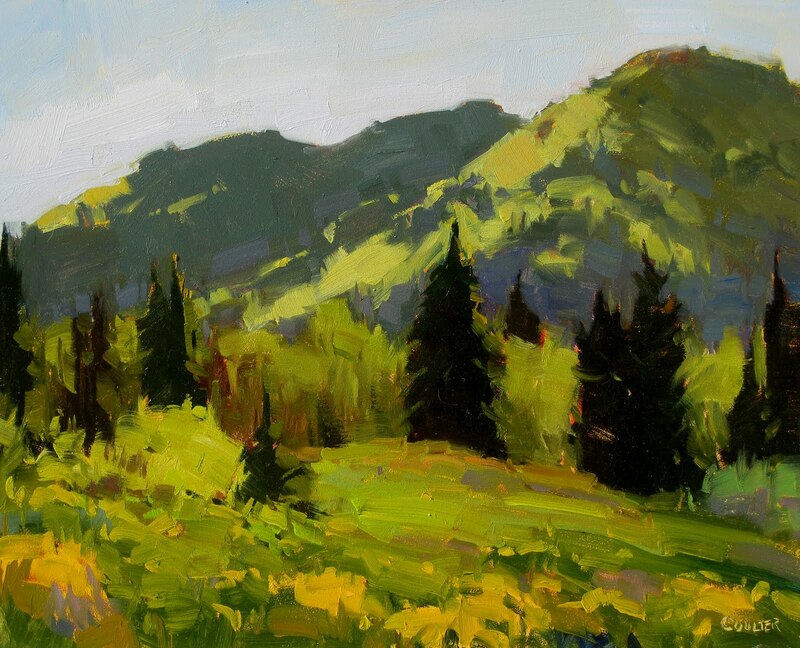 I think that it started warming up back East and everyone came out to paint, and play golf, etc. I was able to get away for a few days to meet with my friend Carol Marine and her friends to paint for a couple days up in Sedona/Jerome area. 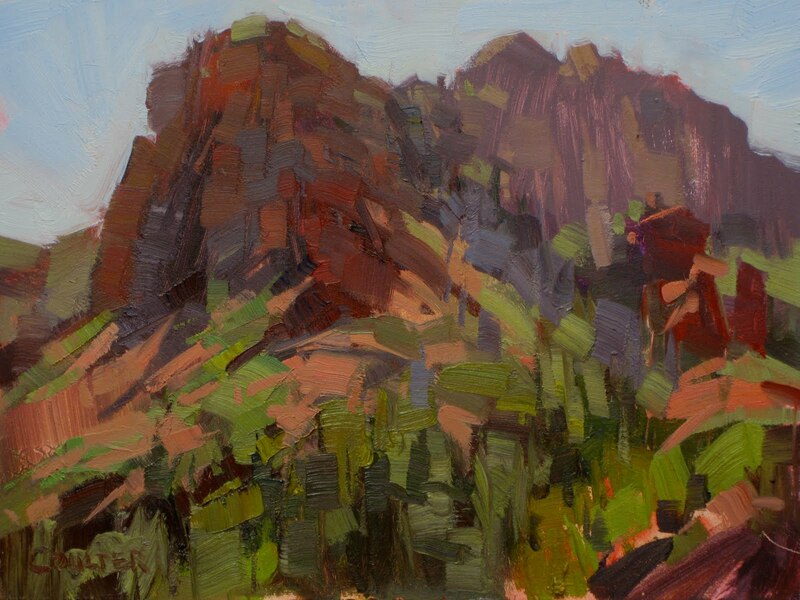 I've been trying out some new materials with my outside painting and this one came out with an almost abstract quality. This is a photo of Carol Marine and I at Slide Rock in Sedona, AZ. This sort of immaculate white baby really stood out in a truck lot of hundreds of old rusted beat up relics. It was also make differently; It was skinny and tall with a couple of wide fenders and a huge black bumper. 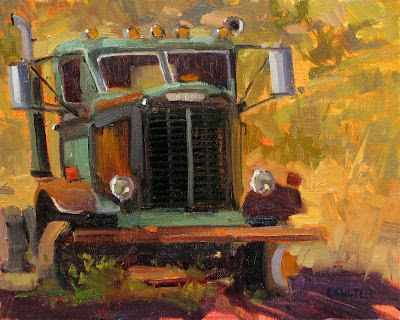 This was the last truck in the row of "Snub Nose Dodge" and "Long Nose International". 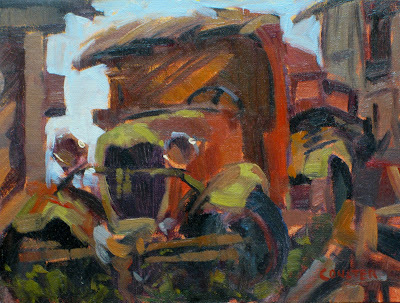 It had a funny look to it because of the huge crane in the bed of a somewhat small truck (in relationship to the crane). It looked like the crane had been used for many years though. 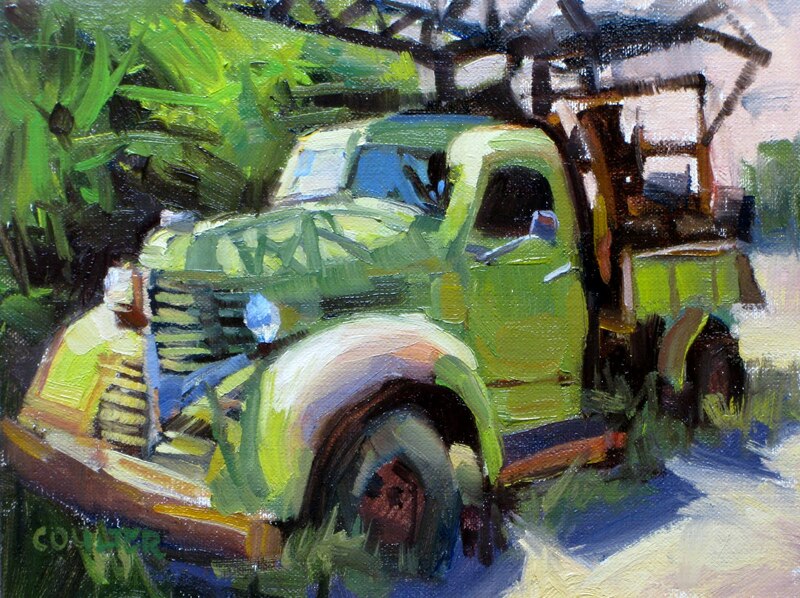 This is the second truck in the line up, right behind the "Snub Nose Dodge". This truck had an incredibly loooong front end! The engine in this thing must have been a monster of it's time.